We’re excited to announce a new opportunity for our registered clubs and leisure centres. We’ve teamed up with Boots UK to launch a brand new campaign that is encouraging the nation to get active and raise money for BBC Children in Need. 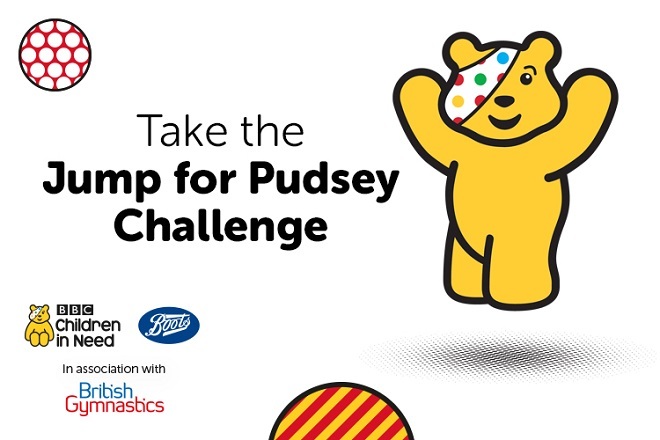 We’ve created a unique ‘Jump for Pudsey Challenge’ which will see gymnasts leaping, hopping, jumping and bouncing their way to draw attention to this great charity and help raise money to fund projects for disadvantaged children and young people right across the UK. Have fun at your club by staging a Jump for Pudsey Challenge. We’ll provide everything you need to get started - it couldn’t be easier to get involved. Wednesday 26th October 2016 is the official Jump for Pudsey day. You can join in and celebrate Jump for Pudsey day or run your challenge on any day between October - December, and as many times as you like! Download your Jump for Pudsey Challenge Delivery Pack from the GymNET Resource Centre. This will provide you with everything you need to know to run a Jump for Pudsey Challenge including the Challenge cards, posters to advertise your event, templates and top tips. By taking part you’ll be helping disadvantaged children and young people in the UK through raising vital funds. The more gymnasts we can get jumping the better!